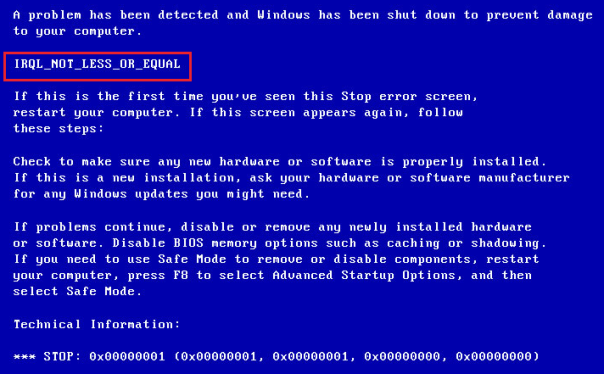 Every so often Windows displays a blue screen with error code DRIVER_IRQL_NOT_LESS_OR_EQUAL with value 0x000000D1, the error compels operating system to shut down so as to prevent damage. This BSOD error is occurred in almost every version of Windows OS, even the latest edition Windows 10 is also encountered the blue screen. In this blog, I will explain why 0xD1 bug check occur and how to solve DRIVER_IRQL_NOT_LESS_OR_EQUAL error. Stop error 0xD1 is encountered in Windows 10, Windows 7, Windows Server 2012 R2, Windows 2000. The main reason for occurrence of DRIVER_IRQL_NOT_LESS_OR_EQUAL error is driver issue. This stop error is usually seen when kernel-mode driver tried to access pageable or invalid memory at high IRQL. The main reason behind this error is driver which need to be disabled. A faulty driver can be viewed in Blue screen of death (BSOD) with a name like xyz.sys. The most common drivers that causes DRIVER IRQL NOT LESS OR EQUAL are tcpip.sys, netio.sys, ndis.sys, athrx.sys. If you can see the driver name in blue screen then disable it from device manager else run Driver Verifier to identify driver. Now restart, during reboot all the drivers will be verified and listed. If there is a faulty driver then it will appear with blue screen. After identifying the driver which causes problem, you can uninstall it from device manager. To solve DRIVER_IRQL_NOT_LESS_OR_EQUAL error, users need to make sure all latest Windows updates get installed on their system. If the stop error is caused by recently installed software or hardware then perform system restore in order to solve DRIVER_IRQL_NOT_LESS_OR_EQUAL error.